My nephew just repainted our kitchen table and chairs. It occurred to me that the chairs are modern day versions of the Windsor chair. Our chairs even have the elegant h-stretcher joining the legs, and they do have a certain charm. I thought we could explore a real Windsor chair that comes from the Library Company of Philadelphia. My chair: American, Side chair, ca. 2000. Maple, height: 101.6 cm (40"). There are varying theories about when the Windsor chair developed, but it seems to have been first made in large quantities in Buckinghamshire in England during the 1600s. The term “Windsor” chair relates to a story in which either King George I (reigned 1714–1727) or King George II (reigned 1727–1760) stopped at a house on the way to Windsor Castle during a storm and sat in such a chair. Finding it extremely comfortable, he ordered that they be made for royal residences. The chair is characterized by slender, turned spindles for the back; a saddle seat; and turned and splayed legs joined by an H-stretcher. It is generally thought that American Windsor chairs were first produced in Philadelphia around 1725. Philadelphia was one of three furniture-making centers during the American colonial period (along with Boston and Baltimore). The chief difference between English and American Windsor chairs was the absence of the pierced back splat. The American chair back was composed entirely of spindles. 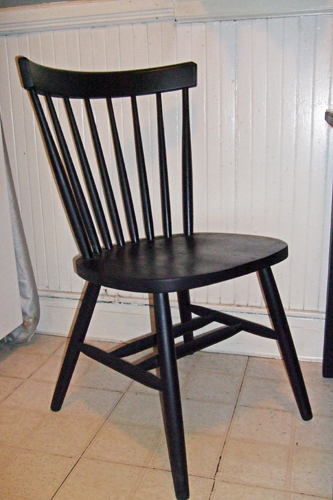 A universal feature of the Windsor chair is the bow-shaped arm rail, composed of a single piece of bent wood. 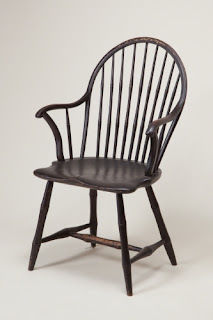 This chair from the Library Company of Philadelphia is called a comb-back style, one of the most common styles since the Windsor chair was first produced. The section of spindles and crest rail resemble the combs women used to keep their hair in place. There were many variations in American Windsor chairs. 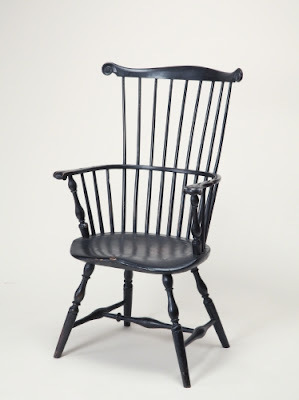 One reason the Windsor chair was so popular in America, was the fact that it was light weight, fashionable, and could easily be carried from room to room. Studio activity: Design a contemporary Windsor chair using charcoal, pencil, or black marker. Keep in mind the key elements of the style: the spindles, splayed turned legs, and continuous curving arm rail (or not if a side chair is preferred). Change the upper back of the chair to reflect a personal point of view about modern life, i.e. how furniture in the 21st century conforms to the human body.